David and I are really looking forward to getting a chance finally to talk about this remarkable gamespace. 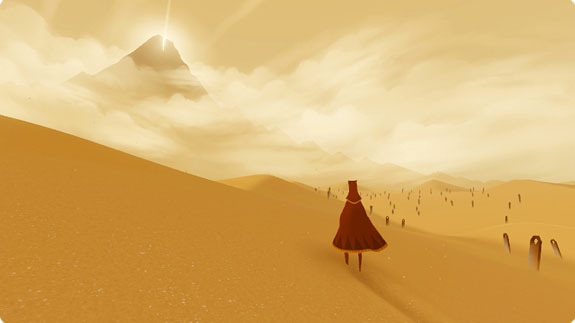 We’ll be going spoiler-free as much as possible, and would very much invite participation by those who haven’t played Journey. We encourage participants to play as they converse, but it’s by no means a requirement. 9:30pm on the usual Mumble server; comment with contact info if you lack the necessary login facts. This entry was posted in Events, Playversation. Bookmark the permalink. I’d love to talk about Journey, I beat it on the day it came out…I stopped by last week but got yanked out of the conversation due to life B.S. I’ll keep it spoiler free. How do you guys/gals usually converse? My daughter just had a soccer game rescheduled to Thursday evening so, unfortunately, I doubt that I’m going to be able to join in. Looking forward to hearing the discussion on the game, though!